Do I need wireless charging? And what does it do special? As the name suggests, this technology is all about charging your favourite devices without any cables or wires. If your phone has wireless charging capabilities, you just need to place it on top of a pad or mat, and it will begin to absorb power. At the moment, you’ll find wireless charging stations in select McDonalds, Starbucks, and some airports. It’s back to school to answer this one. Wireless charging, or inductive charging, works through magnetised coils of wire, creating an electromagnetic field, also called a flux. A moving magnet inside a coil can generate electricity, which can then be transferred to another coil when in close proximity. So, when the coil inside the wireless charger receives electricity from the wall, it can then move some of its power to your smartphone’s coil inside its battery, allowing it to absorb power without being physically connected to anything. When it comes to providing this technology, it’s pretty much a two-horse race at the moment. The big names to look out for are Qi (pronounced “Chee”) and Powermat. Apple also recently announced it would be producing its own wireless charger (coming in 2018), called AirPower (pictured above). Which phones can use wireless charging? 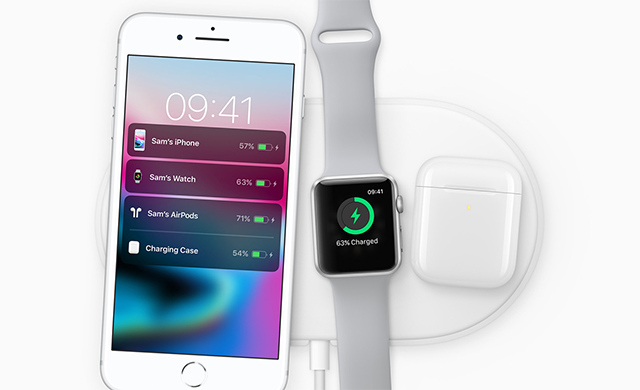 More phones are able to wirelessly charge all the time, but generally the technology won’t power up your device as quickly as it were plugged into the wall, especially compared to the likes of USB Type-C fast charging. You can also buy special cases that plug themselves into your phone’s charging port, and are able to then pick up a wireless charge on your phone’s behalf. What does the future hold for wireless charging? Because the coils in charging mats are so small, they can only charge things that are really close to them. However, if in the future you had a giant magnetised coil in your house, you could effectively charge up your smartphone while it’s in your pocket. Or power your TV with no need for trailing leads. Have you got any questions about wireless charging? Drop us a comment below to start the conversation. What`s new on iOS 11?